If stress can bring blood pressure up, it stands to reason that stress management and reduction can help bring blood pressure down. Along with exercise and weight loss, cognitive behavioral counseling has been shown to make a positive difference in blood pressure. Could the simple act of resolving a relationship conflict with a close friend or relative actually lower your blood pressure numbers? Research is now saying it absolutely can. Not too many years ago, many doctors and even some medical associations were unconvinced that stress reduction techniques could effectively lower elevated blood pressure. [1,2] Times have fortunately changed. If stress can bring blood pressure up, which is easier for most to accept, it stands to reason that stress management and reduction can help bring blood pressure down. When the results of multiple published trials are examined, we see that non-drug methods for reducing hypertension are effective. Along with exercise and weight loss, cognitive behavioral counseling has been shown to make a positive difference in blood pressure. Commonly known as cognitive-behavioral therapy (CBT), this stress management tool helps people think in healthier ways. The focus is on thought (cognitive) and action (behavioral). It can help one notice discouraging thoughts and replace them with better thoughts thus calming the mind and body. Other techniques include meditation, guided imagery, yoga, or muscle relaxation. In one trial published in the Archives of Internal Medicine, it was demonstrated that stress reduction, regardless of what technique was used to achieve it, lowered blood pressure in people with hypertension. In that study, 10 hours of individualized stress management instruction was provided by psychologists to 60 adult hypertensive patients. Many techniques were used in the training, including biofeedback training to consciously regulate subconscious bodily functions, management of anxieties, hostile feeling reduction, and the discussions of relationship difficulties. All of this was personalized to meet the needs of each individual. Forty-five people completed the trial, and data was made available from 36 of them. After six months of follow-up, the total average decrease in blood pressure from stress management training was 11 points in the systolic reading and 8 points in the diastolic reading. So, if blood pressure was 141/88, this approach would bring it down to 130/80—not a bad result at all, and accomplished without any medication! 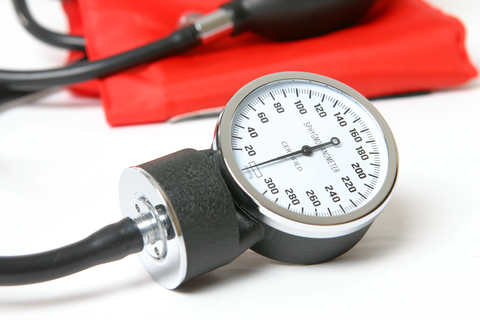 Blood pressure readings are measured in millimeters of mercury, per the blood pressure gauge. The more people were able to reduce their stress levels per the standardized psychological techniques, the greater was their average decrease in blood pressure. When your heart ventricles contract, they force blood throughout your body. This causes a pressure increase in your blood vessels. When your heart ventricles relax to get ready for another contraction, the pressure will lower. A normal blood pressure range for humans is 100/60 to 140/80. The top number is “systolic” and that is when the heart contracts. The bottom number is “diastolic” and that is when the heart relaxes and refills with blood. Hypertension is the chronic elevation of systolic and diastolic blood pressures. When we see a blood pressure of 140/90 we will monitor it for possible progression. An average blood pressure is about 120/80. Click here to view our Blood Pressure Chart. There are also central nervous system (that’s your brain and spinal cord) mechanisms that govern mental stress associated blood pressure changes. This will vary by type of stress and for the most part the response is reproducible. This type of blood pressure change depends on the duration of stress, the time of day it is measured, a persons overall expectations, one’s psychological preparedness, and the family history and background of the person. So if your blood pressure is elevated and you are looking for an effective non-drug way to get those numbers down, maybe the first place to start is to analyze where your stress is coming from and take action to reduce or eliminate that stress. You don’t have to have a psychologist help to identify that stress causing relationship conflict and then be big enough to take the first step to seek reconciliation. Your friendship as well as your blood pressure will be the winner. Chockalingam A, Abbot D, Bass M, et al. Recommendations of the Canadian Consensus Conference on Non-Pharmacological Approaches to the Management of High Blood Pressure, March 21–3, 1989. Halifax, Nova Scotia CMAJ 1990;142:1397–409. The Sixth Report of the Joint National Committee on Prevention, Detection, Evaluation, and Treatment of High Blood Pressure. Arch Intern Med 1997;157:2413–46. Linden W, Chambers LA. Clinical Effectiveness of non-drug therapies for hypertension: a meta-analysis. Ann Behav Med 1994;16:35–45. Max MB (2008). Pain. In L Goldman, D Ausiello, eds., Cecil Medicine, 23rd ed., vol. 1, pp. 151–159. Philadelphia: Saunders. Linden W, Lenz JW, Con AH. Individualized stress management for primary hypertension. A randomized trial. Arch Intern Med 2001;161:1071–80. Reis DJ, Ledoux JE. Some central neural mechanisms governing resting and behaviorally coupled control of blood pressure, Circulation (Suppl.) 1987;76(1):2. This blog originally appeared in 2012 and has been updated. average blood pressure, blood pressure, blood pressure chart, blood pressure readings, brain, breathing exercises, breathing exercises to lower blood pressure, central nervous system, cognitive behavioral therapy, ed, elevated blood pressure, exercise, foods that lower blood pressure, health, health news, high blood pressure, hypertension, lower blood pressure, lower your blood pressure, meditation, mental stress, mercury, muscle, pain, report, stress, stress management, stress reduction, stress reduction techniques, to lower blood pressure, treatment of high blood pressure, university health news.